Adrenal Fatigue is any decrease in the ability of the adrenal glands to carry out their normal functions. This happens when your body is overwhelmed, when stress overextends the capacity of your body to compensate and fully recover. 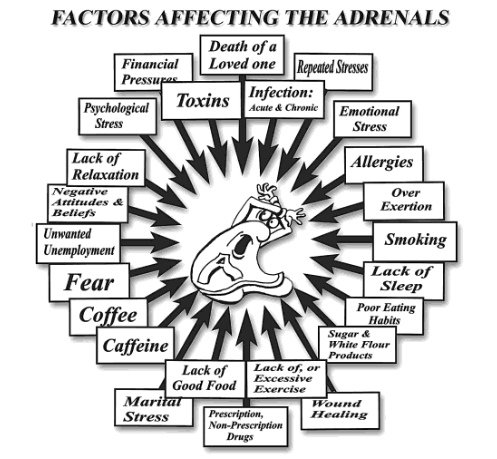 Consequently, the adrenal glands become fatigued and are unable to continue responding adequately to further stress. Adrenal Fatigue is a collection of signs and symptoms, known as a "syndrome" that results when the adrenal glands function below the necessary level. Most commonly associated with intense or prolonged stress, it can also arise during or after acute or chronic infections, especially respiratory infections such as influenza, bronchitis or pneumonia. Many factors can reduce adrenal function, and it is often an accumulation of such triggers over a period of time which are responsible for the syndrome known as adrenal fatigue. As the name suggests, the paramount symptom is fatigue that is not relieved by sleep but it is not a readily identifiable or diagnosable entity like a low iron count or Vitamin B12 in the blood, which is typically viewed by the medical profession as the cardinal sign of fatigue. The Adrenal Fatigue syndrome has been known by many other names throughout the past century, such as non-Addison’s hypoadrenia, sub-clinical hypoadrenia, neurasthenia, adrenal neurasthenia, and adrenal apathy. Although it affects thousands of people in NZ, Australia and around the world, conventional medicine does not yet recognise it as a distinct syndrome. Could I be experiencing Adrenal Fatigue? If you answered yes to one or more of these questions you may be suffering from Adrenal Fatigue. What can I do to feel well and experience more energy? We have many practitioners in NZ and Australia who are getting great results for their clients with Dr Wilson’s protocols and products and we would be happy to recommend a practitioner near you. You may also consider having a saliva cortisol test for adrenal hormones. How do I support my patients with Dr Wilson's products and protocols? Nutrisearch is at the forefront of supporting practitioners throughout Australasia with the most advanced Adrenal Fatigue program. We support Dr Wilson's Program for Adrenal Fatigue and Stress which combines suggestions about lifestyle, diet, rest and body-mind techniques with specific recommendations for dietary supplementation. Together they create a comprehensive Program for Adrenal Fatigue and Stress that effectively supports and promotes healthy adrenal function, vitality and stress hardiness. We have practitioners that have been using Dr Wilson's protocol for several years and say to us that they used to use XYZ brand / protocol to treat Adrenal Fatigue in the clinic and never got great patient outcomes, but now get excellent results with Dr Wilson's approach. For practitioners who wish to open an account with Nutrisearch please click here, or for more information contact us via email or on Freephone NZ 0800 88 44 33 or AUS 1800 177 959.